If your company or organization is planning an event this year to impress your peers, clients and sponsors then why not have your event at StoneHedge GC ! We will customize the event to match the needs of your clients, fundraising, and your charity needs. No events are too large or small for our experience staff. Food and beverage services are available on and off the course. Players can take full advantage of our pro shop and practice range. Stonehedge is masterfully carved out of the lush rolling hills and meadows of Northeast Pennsylvania's beautiful Endless Mountains. Truly, a relaxing natural habitat to play the game at its finest. The mature links are designed for quality play to give ultimate enjoyment and satisfaction on every hole. Our course measures 6,600 yards with a par of 71 and covers the 150 scenic acres across the hills and valleys of the Endless Mountains. From strategically positioned multiple tees through wide-open, wooded and well manicured fairways onto meticulously groomed putting greens, each hole has its own unique character. Ample water, sand bunkers, doglegs and rough brings out the best talents of both professional and amateur golfers. 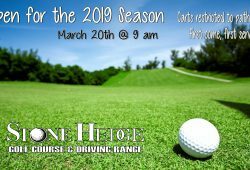 We invite you to test your skill with every swing here at Stonehedge GC.